Updated: We originally reviewed this way back in 2009, so price details have changed. See Deals boxes for latest pricing information. RIM's BlackBerry Curve 8520 is the cheapest QWERTY handset in the company's range, with a price tag £199 with an Orange pay-and-go SIM card, and is ideal for business users on a budget. 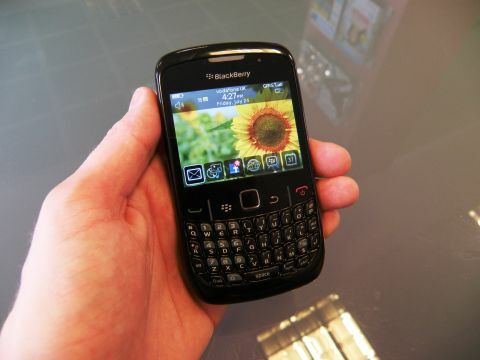 It looks similar to existing BlackBerry Models – including the BlackBerry Curve 8900 – but, unlike most of its siblings, it doesn't feature a rollerball for navigation. You'll find a small optical pad below the display instead. It works like a mini touchpad and is simple and accurate to use. With no moving parts, it's also likely to prove more robust for long-term use. Unfortunately, build quality on the rest of the handset leaves much to be desired – the main difference from more expensive models being the omission of a metal backplate. In its place, you'll find a glossy plastic cover, which is flimsy and feels quite cheap. On the plus side, its compact form factor means this handset slips easily into even the smallest pockets. Matt, soft-touch plastics around the side are also pleasing – as are the media buttons on the top of the handset. A set of unmarked buttons offer control for volume settings and the camera, along with a button to activate voice control. They're integrated into the side of the device and made out of the same material, which is a sensible choice, as it leaves no chance of dirt getting under the buttons. The main navigation, call and end keys sit flush with the screen, with a glossy finish that's a magnet for fingerprints and scratches. The QWERTY keypad that sits below it offers excellent usability. It's not the largest keyboard we've seen, but it's easy to adjust to and the keys are responsive and firmly attached. The 2.6-inch screen is every bit as good as most other BlackBerrys, with vivid and bright colours. The 320 x 240-pixel resolution isn't the sharpest, but images remain crisp and easy on the eye. The BlackBerry OS is still as intuitive as ever, with large, clearly labelled icons on the menu. A set of shortcut icons sit on the home screen, with full accessibility to other functions offered by pressing the button to the left of the optical pad. This handset excels when it comes to email use, with push email support delivering your mail instantly. Setting up your account is a simple matter of typing in your email address and password. We found the handset responded quickly to our inputs, with a 512MHz processor moving things along nicely and with little lag. The 256MB of RAM offers minimal storage space, although a microSD slot is in place for adding further memory, with cards of up to 16GB supported. Connectivity is reasonable for an entrylevel phone – there's no 3G/HSDPA, but you will find Wi-Fi built in. Unfortunately, GPS has been left out to keep costs down, so you won't be able to use the BlackBerry as a satellite navigation device. Overall, the Curve 8520 is a nice little handset. It's a shame that some of the materials used aren't of a higher standard, but it offers good usability and a cheap entry point into RIM's impressive BlackBerry range.